Cancer is produced when a cell becomes immortal (it will no longer die in the normal way) and grows without control in an undifferentiated manner (it does not develop into the normal cell type e.g. kidney, liver, lung etc.). There are many triggers for this situation, some are genetic and some are environmental. However, one interesting viewpoint is that the cell no longer behaves normally and should be recognized as different by the host immune system and destroyed, as with viral infections. Unfortunately, the host immune system has many controls in place to prevent such action against host (self) cells. In this blog 1 describe a new method for preventing the growth of cancer that uses the body’s own immune system to attack the tumour. To achieve this, key controlling elements are inactivated by binding artificially-produced antibodies to them – these antibodies are produced separately outside of the patient’s immune system and are a replacement for conventional drugs that might achieve a similar result – by switching off these key control elements the patient’s immune system can destroy the tumour cell. In a simple world, cancer would not exist as the body’s immune system should recognize the tumour as “foreign” and destroy it. However, this does not occur and, in addition, there is a danger in having such a response as the tumour cell is not really “foreign” in the way an infectious agent such as a virus is, but is in fact “self”. An immune response to “self” cells is known as an autoimmune response and it is very dangerous — autoimmune diseases are usually lethal (for example AIDS). Therefore, the human body has a series of controls in place designed to prevent such an autoimmune response. This situation is complicated further by the fact that some cancers actively interfere with the immune system to prevent any such attack against them. One protein that acts to slow an immune response is CTLA-4 and the important job it does in controlling the immune system and preventing an autoimmune response is clearly seen in mice that have been genetically engineered to remove the CLTA-4 protein — they die in weeks as their own immune system attacks and destroys the mouse’s organs. One concept for “stopping cancer” is that by blocking CLTA-4, this would lead to a vigorous attack, by the immune system, of the tumour and, indeed, this was found to happen. In addition, there is another control system, PD-1, a protein found on the surface of T-cells (an important component of the immune system), which when bound by an external protein will force the T-cell to destroy itself, which in turn slows the immune response. Unfortunately, certain cancer cells have developed surface proteins that elucidate this response from T-cells, by binding PD-1, and consequently triggering an early destruction of T-cells that might otherwise have been targeted against the tumour. If PD-1 could be blocked, the tumour cells could no longer trigger T-cell destruction and the T-cells would, instead, target destruction of the tumour — this provides an ideal, targeted treatment against the cancer. Therefore, the real question of how to “stop cancer” is how to block the function of CLTA-4 and PD-1 in a very accurate way without stressing the body (by avoiding chemical-based drugs) and thus use the body’s own defence system to stop the cancer. Normally, when developing drugs for the treatment of various illnesses the idea is to target a drug against an important region of a protein, in such a way that the normal function of the protein cannot be achieved. A relatively new technology has, in recent years, been used to block protein function in this way and this technology involves the use of antibodies. To understand how this technology works it is necessary to understand the structure of an antibody. Representation of an antibody showing the v region responsible for binding the antigen. The constant region (c) identifies the antibody as human, mouse etc. and only varies between species. The important capability of antibodies, that makes possible this blocking function, is their ability to bind very tightly to their antigen. The exactness of binding by an antibody, to its target protein, is a key part of the natural immune response. The immune system has a very effective feedback-amplification mechanism, which allows a specific antibody, that tightly binds a specific antigen, to be recognized and mass produced, these antibodies will only bind to the antigen that they first recognized and can make the immune system react against cells containing that antigen — where such cells are infected by a virus that produces the antigen the immune system can destroy these infected cells. The human immune system is one of the most advanced protective systems in nature and provides both an early response and a long acting immunity to infection, which is one of the reasons we live as long as we do! Polyclonal antibodies bind to different sites on the same antigens (A). 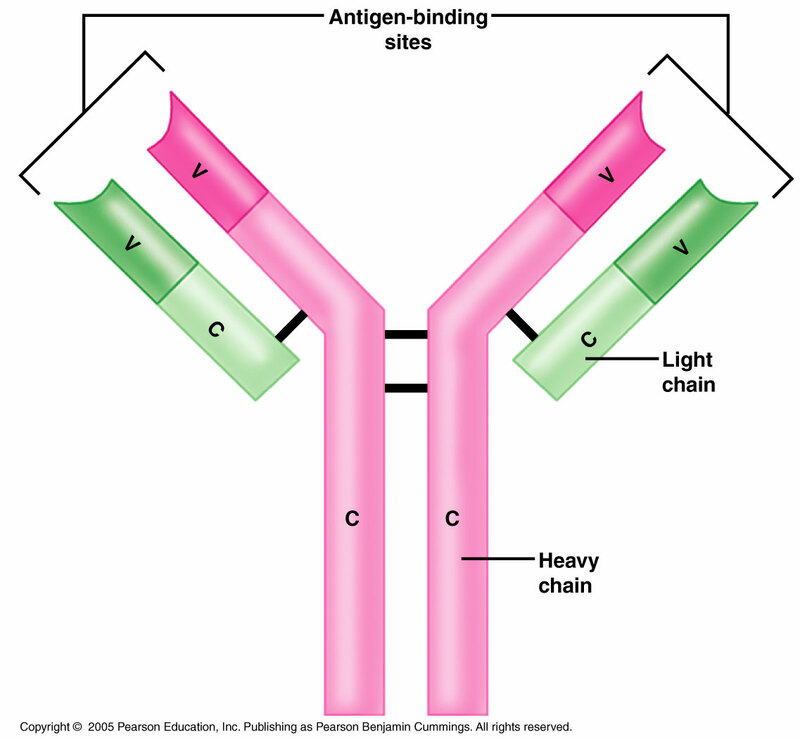 These are easily isolated from blood following infection, or following injection of an antigen, and although the antibodies will bind very specifically to a specific antigen, they bind to that antigen at a wide variety of different sites — one antibody binding one site, while another antibody binds a different site on the same antigen. 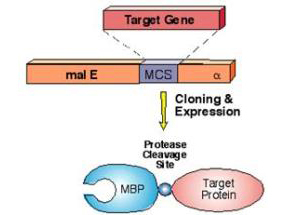 However, such antibodies, known as polyclonal antibodies, bind to various regions (epitopes) on the surface of the antigen, which means that they cannot be used to block the SAME specific site on the protein in the way a drug is designed to do and this means that the antibody cannot be used to block that normal actions of CLTA-4 and PD-1 as required. During the 1990s all of this changed when monoclonal antibodies were first isolated, initially from mice — these bind to a specific, single site (epitope) on a protein and, consequently, blocking of protein/enzyme function using a monoclonal antibody became possible. Humanization of monoclonal antibodies, in which the constant region (Fc) is replaced by that from a human antibody, has allowed selective targeting of proteins exposed on the surface of human cells, or specific enzymes that are active within human cells. This novel approach to attacking cancer does not require drug development, but uses monoclonal antibodies that have been produced in a laboratory and are targeted against CLTA-4 and PD-1. A number of companies have developed these antibodies and trials of this mechanism for controlling cancer is progressing well; although, there are still problems associated with inflammation and local reactions to the antibodies, but anti-inflammatory drugs help control this situation and the reaction are much less severe and short-lived. A recent (2007) study of the use of monoclonal antibodies to both of these antigens (CLTA-4 and PD-1) in 53 patients has shown more than 50% responded with tumour shrinkage and now >900 melanoma patients are being treated in a more extensive study and the results already look very promising. Such novel treatments will ease the need for chemical-drug design and development and could provide a more focussed way to treat cancer without the need to use radiotherapy or chemotherapy. Drugs based on the use of antibodies are already making significant inroads into the treatment of a wide range of diseases (e.g. Ebola Infections) and, as we begin to understand biological systems better, more breakthroughs will be possible in this area. What is exciting about this research is that they are targeted through PD-1 binding to specific tumour cells, they use the patient’s own immune system to combat the cancer without drug treatment and, as we understand the biology of the immune system better, there are likely to be more targets for antibody binding. As we begin to better understand the way the immune system works, more such treatment will become possible allowing a multi-target approach to stop cancer. Protein aggregation being seen as important? I have just come across a paper that summarises some of my views on what should be important research. Murphy and Roberts (Biotechnology Progress, 2013, 29(5): p. 1109-1115) have made the observation that for many years protein aggregation has been seen as a nuisance factor that prevents high yields in production of protein from recombinant sources, or is a hassle with certain purification methodologies. However, the understanding of the mechanism behind prion misfolding, that leads to BSE and CJD diseases, and amyloid formation, that is involved in Alzheimer’s disease and other diseases, have shown that this subject should never have been ignored for so long. 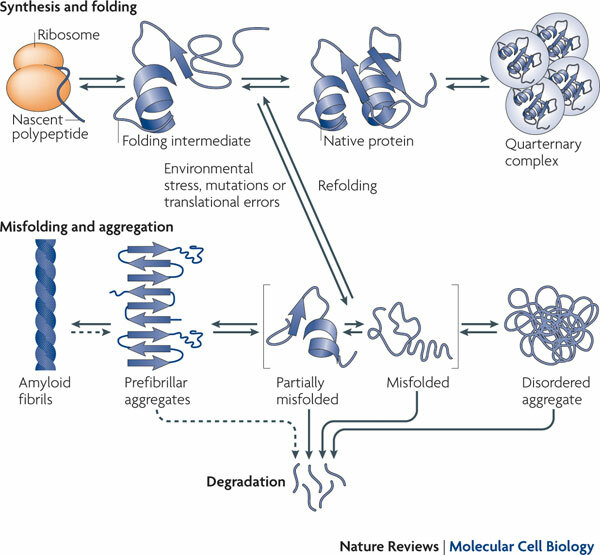 So what is protein misfolding? As the diagram shows, when a protein is first synthesised by the ribosome it immediately begins to fold as hydrophobic amino acids are incorporated (these small components of proteins that are strung together to form the protein can be either hydrophobic – dislike a water-based environment, hydrophilic – like to be surrounded by water, or neutral). This hydrophobic core will fold to minimise contact between water and the hydrophobic amino acids. However, the process is not simple and many other proteins and factors can be involved, including chaperone proteins that help the native protein to fold correctly, and when a protein is produced in very large amounts this folding system may go wrong and the protein may aggregate together as a simple means of avoiding exposure of the hydrophobic core. Over-production of proteins from recombinant (genetically engineered) sources is a classic starting point for this problem and has for many years been a major issue for the biotechnology industry. However, for the research scientist there has been a different problem associated with this problem – wasted research time that cannot be published! I can illustrate this problem with a story from my own work. 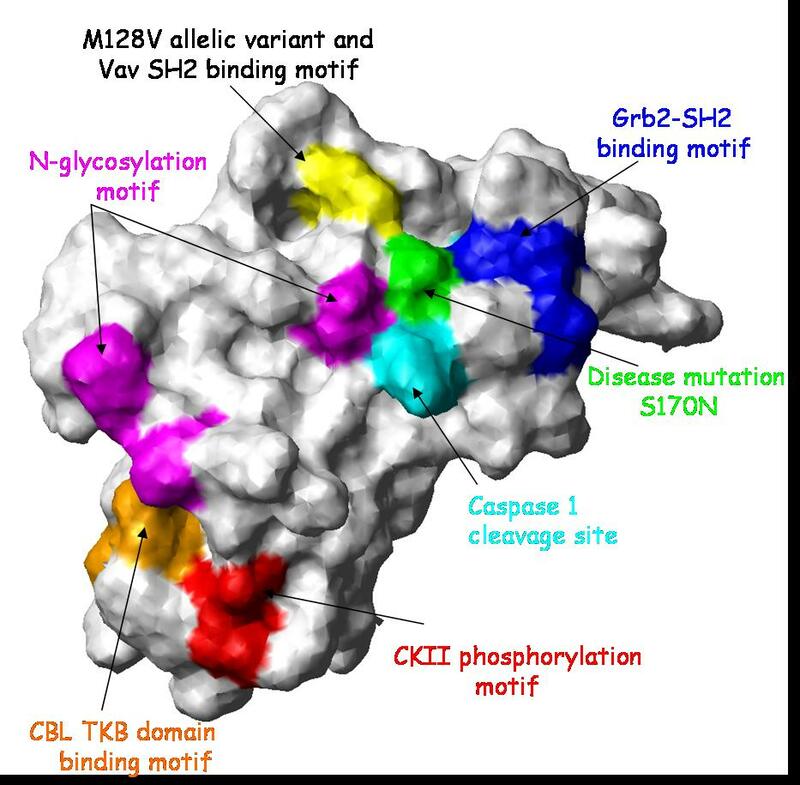 I have worked with a multi-subunit protein for many years and a key step in this work was being able to over-produce one key protein (the largest) in milligram quantities. Once we had found a mechanism to do this we were able to publish the work, but we always looked for a better, or easier, solution. 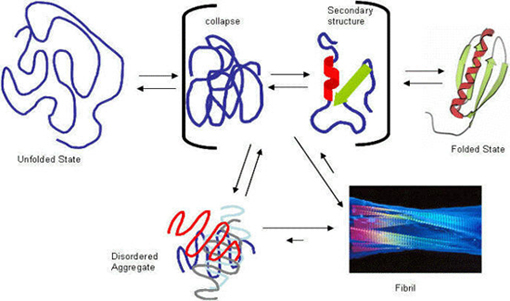 Interestingly, one such solution was to fuse another protein onto the required protein, which could be used to pull it out of the bulk mixture of all proteins, but you can attach the fusion protein to either end of the protein of interest and yet, when we swapped ends for the attachment the fusion was insoluble due to aggregation. Yet, this negative result was never published as there is no journal that would encourage such a publication despite the information being really important to others working in the area. The problem in science is that journals do not publish negative results even though such information can be very useful. I would love to see some of the more enlightened journals review this policy and start to publish negative results. Maybe the renewed interest in protein aggregation, driven by the importance in disease states, might encourage this new approach. I have a feeling that there is already a lot of data about the causes and reasons for protein aggregation that could help us understand amyloidosis and other protein-based diseases, but also, more importantly, a lot expertise that could benefit the research in this key area. Prions, protein aggregation and disease development. Prions are believed to be the causative agents of a number of diseases that develop through protein aggregation (amyloidosis) including BSE (bovine spongiform encephalopathy) in cattle and CJD (Creutzfeldt-Jakob disease) in humans. The formation of protein aggregates produces plaques within the normal neural cell structure, disrupting the cellular structure and resulting in a soft, spongy like appearance. The result of these effects are varied and include dementia, convulsions, balance and coordination dysfunction and, in humans, disturbing personality changes. Prions differ between species and, in general, cross species transfer is not infective of the disease. However, CJD prion is thought to have been derived from the BSE prion, transmitted through contaminated meat. Whether prions are the agent which causes the diseases, or are a symptom caused by a different agent, is still debated by some researchers. However, the general consensus is that CJD and BSE are prion-based diseases. Prions are proteins that have two different states into which they can fold and it is this change in the folded state that leads to aggregation and development of the associated diseases. Prions are found in many very different species and a recent study (Kim et al., Nature, 2013. 495(7442): p. 467-473) has identified key amino acids, conserved across prion proteins, which appear to be important in the aggregation process. This suggests that a more focussed drug development project could be initiated, in which drug docking could be used to design drugs to interfere with the aggregation process. Although such developments may still be a long way away, this is an exciting time where modern technologies could be used together to provide more breakthroughs in halting these diseases – I am for ever optimistic! The ultimate aim of most genetic engineering experiments is to produce large quantities of a biologically useful protein from and artificial system, which simplifies both production and isolation. There are many means of achieving this aim and both hosts used and vectors that carry the gene of interest vary widely. However, a recent article captured my interest in that it described a DNA “tag” that increases gene expression (Hansted, J. G., et al. (2011). Journal of Biotechnology 155: 275-283). Genes are expressed, but proteins are produced! I see even the Abstract of this paper described “expression of…proteins” and I imagine it is now impossible to make anyone understand why this is wrong – and they say it is progress! However, the paper is interesting and describes a short (21bp) DNA sequence that appears to provide a (potentially) universal mechanism for increased protein production – it is not clear that any effect on gene expression was observed as the authors refer to increased “protein expression“!